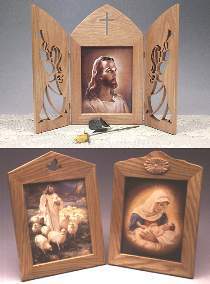 Display your 8" x 10" photos or religious prints. Cathedral-style hinged doors are decorated with cutout angels (top photo). Plan also includes patterns for self-standing frames (lower photo). Plans drawn FULL SIZE.